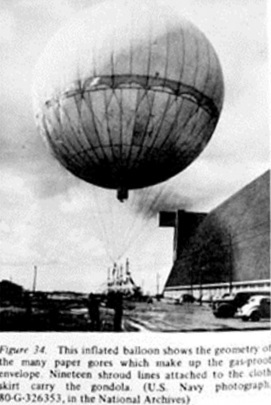 On this date in 1944 Japan began an explosive balloon cam­paign against the U.S. and Canada. Over the next five months the Special Bal­loon Regi­ment of the Japa­nese army launched about 9,300 hydro­gen-filled rubberized-silk or paper “fire bal­loons” (fūsen bakudan, lit. “balloon bomb”), or Fu-Go’s as they were known in Japan, from the west­ern side of Honshū Island. Made mostly by school girls and carried by the high-alti­tude jet stream, the 32‑ft dia­meter “secret wea­pons” carried a con­tainer of mag­ne­sium flash pow­der and 33‑lb high-explo­sive anti­per­son­nel bombs. Crude but ingen­ious, building a bal­loon that carried 1,000 lb of gear and that could sur­vive a 5,000‑mile trip across the Pacific Ocean, then auto­mat­ically drop its pay­load was tech­ni­cally chal­lenging. A hy­dro­gen bal­loon expands when warmed by the sun­light and rises, then con­tracts when cooled at night and falls. Japa­nese engi­neers devised a con­trol sys­tem driven by an alti­meter that dis­carded bal­last (sand­bags) or vented hy­dro­gen to main­tain alti­tude (30,000–38,000 ft). Some 285 to 300 fire bal­loons reportedly reached the North Amer­i­can conti­nent, some floating in­land as far as Mich­i­gan. Most of the fire bal­loons fell harm­lessly into the Pacific or self-de­structed before reaching the main­land. How­ever, pieces of paper from a Japa­nese fire bal­loon were found in a Los Angeles street. When the bal­loons were sighted near the West Coast or over land, air­craft from the U.S. Navy or U.S. Army Air Forces flew inter­cept mis­sions to shoot them down. The only known victims of one of these devices were six Ore­gon pic­nickers who were killed on May 5, 1945, when they tried to move a downed bal­loon and the anti­per­son­nel mine exploded. One bal­loon-caused brush fire trig­gered a shut­down of the Han­ford, Wash­ing­ton, atomic pro­cessing facil­ity, iron­i­cally delaying work on the pro­duc­tion of material for the atomic bomb that was later dropped on Naga­saki, Japan. Following two news media accounts in early Janu­ary 1945 of a “bal­loon mystery,” the U.S. Office of Censor­ship enforced a news black­out on the sub­ject to reduce the chance of panic among West Coast resi­dents and to deny the Japa­nese any infor­ma­tion on the suc­cess of their launches. 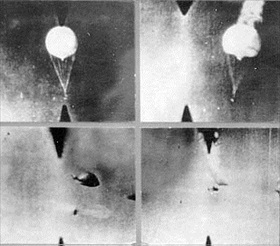 Dis­couraged by the appar­ent failure of their effort, the Japanese halted their balloon attacks in April 1945. Left: A Japanese balloon bomb reportedly discovered and photo­graphed by the U.S. Navy in Japan. Large indoor spaces such as sumo halls, sound stages, theaters, and hangers were required for bal­loon assem­bly. The fire­bombing of Japa­nese cities by U.S. B‑29s destroyed two of the three hydro­gen plants needed by the pro­ject. Despite the initial high hopes of their designers, the Japa­nese fire bal­loon cam­paign was totally ineffec­tive and sur­vives in memory only as an ingenious curiosity. Right: A Japanese fire balloon of mulberry paper (“washi”) re-inflated at Moffett Field, Cali­for­nia, after it had been shot down by a U.S. Navy plane on Janu­ary 10, 1945. The bal­loon is now owned by the National Air and Space Museum. Fire bal­loon enve­lopes and appara­tus were found on the West Coast (Alaska, Wash­ing­ton, Ore­gon, and Cali­for­nia); in the Moun­tain states (Ari­zona, Nevada, Idaho, Mon­tana, Utah, Wyo­ming, and Colo­rado); and in the Mid­west (Texas, Kansas, Nebraska, North and South Dakota, Michi­gan, and Iowa). A few bal­loons landed in Mexico and Canada (Mani­toba, Alberta, Saskatchewan, Northwest Territories, and the Yukon). Left: Japanese fire balloons shot down by a Lock­heed P‑38 Light­ning near Attu in the Aleu­tians cap­tured on gun cameras, April 11, 1945. Fire bal­loons flew very high and sur­prisingly fast, and U.S. air­craft destroyed fewer than 20. Between 285 and 300 fire bal­loons reportedly landed in the U.S. The last one found was in Alaska in 1955, its pay­load still lethal after 10 years. Japanese war­time propa­ganda announced fire bal­loons had wreaked havoc to forests, cities, and farm­land, inflicted casu­al­ties as high as 10,000, and described an Amer­i­can pub­lic in panic. 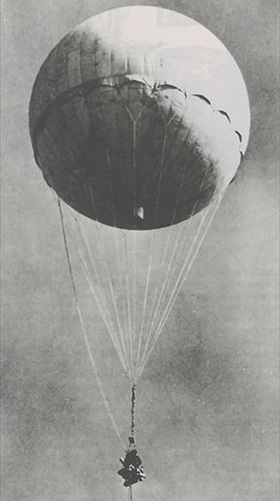 The truth was, the six people killed in Ore­gon (one woman and five chil­dren) were the only casualties caused by Japan’s fire balloon campaign. Right: The Japanese performed a small number of non-balloon attacks on the U.S. main­land throughout the war. In Febru­ary 1942 Japa­nese sub­ma­rine I-17 shelled an oil field up the beach from Santa Bar­bara, Cali­for­nia, and damaged a pump house. 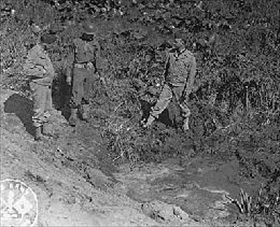 Later that June sub­ma­rine I-25 shelled a coastal fort, Fort Stevens in Ore­gon, churning up a swamp and a base­ball field (photo shows sol­diers in­specting the shell crater), and in Septem­ber I-25’s crew assembled and launched a small float plane that dropped incendiary bombs, starting a few small forest fires.